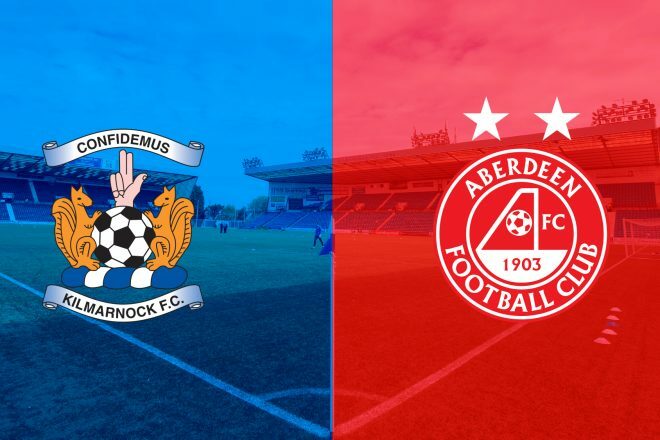 Aberdeen are back down to the west coast this weekend as they face an in-form Kilmarnock side at Rugby Park. The Dons are coming into this one with back to back wins against Rangers and Hamilton Accies and will take confidence heading down to Ayrshire for another big match. A win could push The Dons up the table and with three games before the Betfred Cup Final, it’s a chance to build some momentum. Steve Clarke’s Kilmarnock side have once again kicked on from their excellent form at the tail end of last season and lie in 3rd place, one point behind champions Celtic and six points ahead of Aberdeen. Killie earned a 1-1 draw at Ibrox on Wednesday night courtesy of Greg Stewart’s equaliser, but attacker misses out against his former club on Sunday due to suspension. 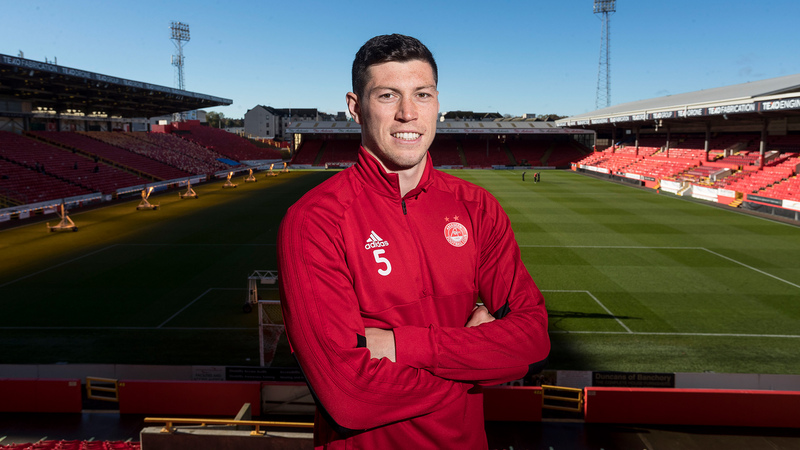 On Thursday lunchtime Derek McInnes and Scott McKenna spoke with the media ahead of the trip to Ayrshire. “We spoke before the Semi-Final about the importance of what getting to a cup final can bring to a club with momentum, the feel-good factor and the confidence of beating a team like Rangers. The game itself last night could have been trickier than it was. I thought the players were terrific and we scored some high-quality goals and got another clean sheet. It wasn’t perfect, and there were one or two moments we could have done better defensively by looking after the ball better, but to get three goals, another clean sheet it’s a step in the right direction and an important three points for us. “We know it will be a difficult game when we play Kilmarnock away, but I think after our last two results we need to go into the game full of confidence. It was a big result Sunday and then to go out and score three goals last night is good for us and we’re in a good place just now and looking forward to the game. It’s been seven years since The Dons lost a league match at Rugby Park and Derek McInnes has won all nine of his visits as Dons manager. Until this season he had only dropped points once home and away against Kilmarnock, but that near-perfect record was finally ended when Eamon Brophy and Greg Stewart combined to give Killie the points at Pittodrie. Last season a rejuvenated Kilmarnock made a remarkable surge up the table after Steve Clarke took over, but were unable to beat The Dons, who seemed to have their number. In November The Dons visited Rugby Park for the Sunday lunchtime kick-off on the back of a difficult period as they had lost to Motherwell in the fixture before. Kenny McLean had the travelling Red Army cheering after less than 60 seconds with an early strike. It was two before the quarter-hour mark when Kirk Broadfoot flicked a free kick into his own net and The Dons were on easy street. Jordan Jones grabbed one back with 20 minutes remaining to set up a tense finish, but Stevie May soon evaporated any chance of a comeback with an excellent solo effort minutes later. The Scottish Cup Quarter-Final replay between the sides offered the winner a place at Hampden. On a tense and freezing night The Dons did it the hard way via the penalty shootout. After Killie took the lead in extra time through Stephen O’Donnell it looked as though Killie would get the job done, but Kenny McLean slammed home a penalty shortly afterwards to send the game all the way to penalises. 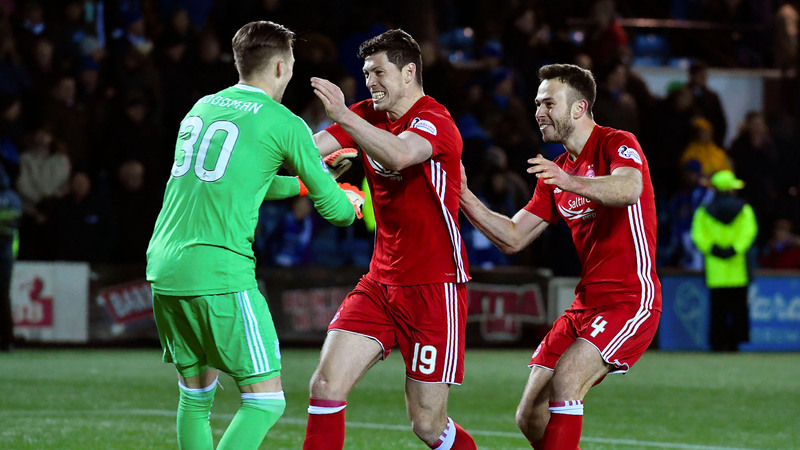 Former Kilmarnock ‘keeper Freddie Woodman had only joined The Dons a month before and his three saves proved decisive as Aberdeen went through. As the season reached an exciting climax, The Dons were looking to finish as runners-up for the fourth consecutive season. To do that they faced arguably the most difficult post-split in years with Rangers, Hibs and Kilmarnock in the hunt for the European places. After the disappointment of their Hampden Semi-Final the week before, The Dons went into it needing a win to stay ahead of the chasing pack. A thoroughly professional performance from Derek McInnes’s men eased the pain somewhat from the week before and Kenny McLean and Shay Logan scored the all important goals that would contribute to another second once again through an excellent run in the post-split. Killie hold the slightly favourable record when facing Aberdeen on their own patch with 50 wins in the league compared to The Dons’ 43 and 14 draws. 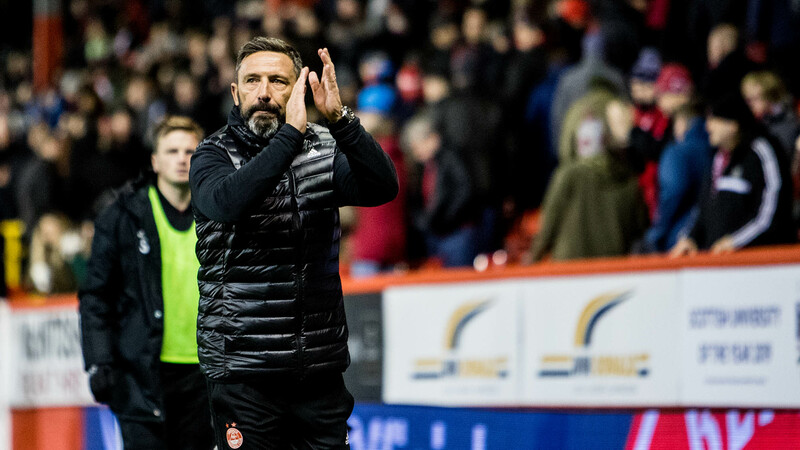 The largest margin of victory for Sunday’s visitors stands at four, which has been achieved three times, including twice under Derek McInnes. Back to back visits to Rugby Park in 2015 and 2016 led to 4-0 wins as The Dons continued to prove a tough opponent. If you can’t join us at Rugby Park on Sunday lunchtime, make sure to tune into RedTV with live audio for UK and video for International Subscribers. Post match we will have goals, highlights, reaction and a full match replay. Enjoy the game and lets hope The Dons can make it three wins in a row. COYR! Aberdeen kept up their incredible record at Rugby Park under Derek McInnes but they left it very late. After a poor first half performance they found themselves 1-0 down, Boyd scoring a debatable penalty. The visitors were better in the second period but in needed an instinctive touch from substitute Bruce Anderson to get them back into the game. 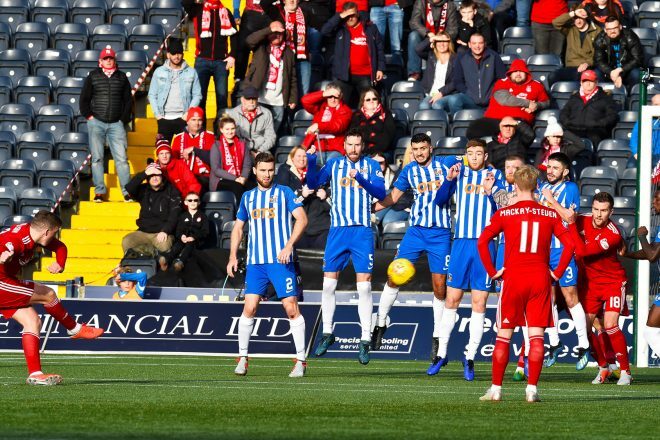 Then with three minutes remaining Lewis Ferguson fired a low free kick past MacDonald to grab the three points for the Dons. Derek McInnes made one change to the side that started Wednesday night’s win over Hamilton Accies with Dom Ball replacing Scott Wright for the visit to Ayrshire. The hosts were missing former Don Greg Stewart through suspension, Eamonn Brophy also missed out through injury meaning a return to action for Kris Boyd. The home side started strongly with Taylor and O’Donnell both getting balls into the box for Boyd to attack and he probably should have done better with a header from six yards when the cross from the right found him in the 6th minute. Devlin did just enough to put him off. It has been an uncomfortable start for the visitors who struggled to get to grips with the game and the surface. It took until the 17th minute for the Dons to get their first attack of the game when Wilson broke to win a corner. Dom Ball looked to have got on the end of the initial corner, but the ball was turned behind for another corner which was headed wide by Logan. Kilmarnock were enjoying the territory without really stringing many passes together, the first 20 minutes punctuated by stoppages for fouls and offside’s with a physical battle unfolding in midfield. McGinn then got the better off the full back for the first time and fizzed a ball to the backpost, Taylor did well to knock it clear with Mackay-Steven ready to pounce, signs of encouragement for Aberdeen. Both teams were having to work hard to create and Killie fashioned a half chance when Tshibola showed great vision to find O’Donnell in the area, from a narrow angle he rattled the ball across the face of goal and just wide of the far post. Boyd was unmarked on the penalty spot looking for a cut back. Just after the half hour mark Killie broke with quality, Tshibola, Jones and Boyd linking up well before Jones picked out O’Donnell at the back post. Lewis looked to have turned his shot round the post but Burke was there to keep the ball in play and went down under a challenge from Logan to win a penalty when he really had nothing else on. At first glace there looked very little contact as the winger went to ground. Boyd stepped up to take the spot kick and hit the ball low and hard past Lewis right into the corner to send the hosts in front. A very good penalty as big Joe went the right way. The Killie striker then unnecessarily goaded the Aberdeen fans. The incident had certainly brought the game to life and minutes later Taylor picked up the first yellow for a late challenge on GMS. If the Dons were going to get back into the game they would have to fight and scrap with Killie giving up nothing easily. Aberdeen were losing too many personal battles all over the field. Logan followed Taylor into the book for bringing down Tshibola on the halfway line when the midfielder was looking to break. Aberdeen finished the half on the front foot getting a few balls into the area but were unable to test MacDonald. After a lethetic first 45 they would require an improvement in the second half. At the break the Dons made a change with May replacing Ball and the shape changing to a 4-4-2. 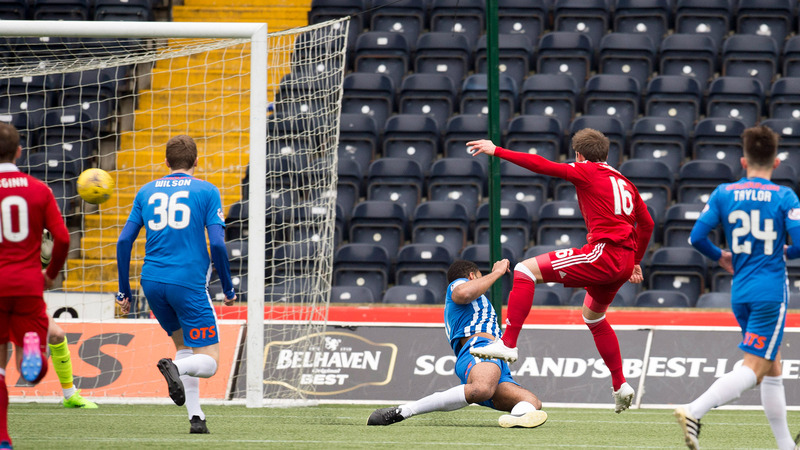 Although Aberdeen enjoyed some early possession the home side could have doubled their lead when Broadfoot got on the end of a corner, but his header into the ground bounce over. A minute later Shinnie almost forced his way into the area but MacDonald was off his line quickly and saved bravely at the Aberdeen captains feet. Then a half chance when Burke fired over from the edge of the area after Lowe was unable to clear. Killie continued to look the more dangerous from wide areas. There was an increased intensity in Aberdeen’s play, but it did not translate to chances although they were now competing better in the middle of the park and Stevie May was looking well up for the physical battle. Burke had another effort from outside the box as the hour mark approached, over the bar. It had been a fairly bad tempered game, there is not much love lost between these sets of players and a number of challenges went unpunished. Dicker somehow escaped a yellow card for a late cynical tackle on GMS, although to be fair to referee Bobby Madden he would keep his cards in his pocket later in the game when players on both sides might have been yellow carded. With a quarter of the match remaining Wilson was replaced by Bruce Anderson. Could he be the man to save the Dons? Within minutes of taking to the field Anderson was there to direct the ball past the keeper after some excellent work from McGinn and he had been set up by May. It was an instinctive finish from the youngster which left MacDonald with no chance. It was Aberdeen’s first shot on target, what an impact to level the game with 15 minutes remaining. As the game went into the closing stages both sides were looking for a winner and things opened up. Ndjoli got in behind the defence and found Power at the edge of the box, he went close but the shot landed on the roof of the net. The Killie midfielder had an excellent game, probably the best player on the pitch, but will feel he should have done better on this occasion. With five minutes remaining Wright replaced McGinn. Just as McGinn left the field Aberdeen had a free-kick 25 yards from goal, it was ideal territory for the winger but who would step up in his absence? Hampden hero Lewis Ferguson took control and found the bottom corner with a fine curling strike. Two shots on target and two goals, clinical stuff from the visitors which had the 865 strong Red Army on their feet. With three minutes of added time played the Reds still had some defending to do though as Kilmarnock got the ball in the box. Aberdeen might have done better with a couple of breaks but at the other end the Dons stood strong, Devlin again outstanding in this situation, to see out a hard-fought three points on the road. Not the greatest of performances, but once again this side showed great spirit and character to get the job done.